If you haven’t discovered the fun of making bows and creating beautiful things with ribbon, you’ll be pleasantly surprised at how very easy it is to add ribbon-crafting to your life. It takes very little time to learn and to do. The bows you make can be as simple as a two-loop shoestring tie or as elegant as a multi-layered gift bow – but YOU CAN MAKE THEM ALL! Leaf through the pages, then choose your favorite spools of ribbon to begin creating scrapbook embellishments, gift toppers, and so much more. 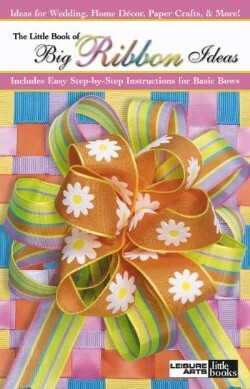 Little Book format includes easy step-by-step instructions for basic bows: Floral Bow, Stacked Tie Bow, Shoestring Tie Bow, Center Loop Bow, Creative Combinations, Easiest Bow Ever, and Ribbon Roses. Leaflet - 32 pages plus cover. Leisure Arts.